I’m reminded of the song*–[see the title above]–as I swerve and slow down on my way to the market in Realmont, avoiding baby rabbits and several pheasants who are risking their lives coming out on a Wednesday here–of course they don’t know that. The countryside seems alive with game. Last week four or five leaping deer–little ones–arched across a field to the safety of a thicket–I’d never seen that here before. It’s the hunting season again. Each Sunday and Wednesday the shots ring out–sometimes so close they make me jump. 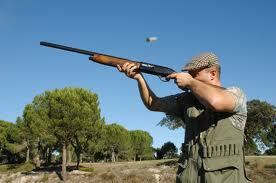 Two at a time in quick succession from the double barrelled shotguns favoured by the hunters. 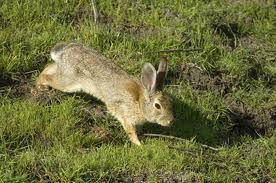 “Run rabbit run rabbit run! run! run!”–though it’d be better to hunker down in the burrow, they don’t know any better. I’ve never seen a hunter with treasure in his pouch, though. Is it the “thrill of the chase” that keeps them coming out or simply a walk across the fields with their dogs, in the early autumn sunshine? Perhaps the truth is they’re hunting for a connection with a disappearing past. Twenty odd years ago, when we were London townies down for the weekend, we’d be woken on Sunday morning by a barrage of gunfire and the barking of gun dogs. The noise is much diminished these days–and “walnutting” [ my version of “La chasse”!] not such a dangerous Sunday morning sport. Bang! Bang! Bang! Bang! Goes the farmer’s gun. * The song is sung by Bud Flanagan and Chesney Allen–two Music Hall stars who teamed up between the wars, and were also members of The Crazy Gang . I remember the song as a child my dad use to sing it to me. Are you allow to keep and eat the rabbits shot? I have never tasted rabbit, I have seen them in the butchers shops in Scotland, I have eaten venison,and game birds and been out on the moors but I am a coward and make myself scarce before the kill, I do not like to be around when such beautiful creatures are shot. Like I say a total coward. I’m sorry, maybe I shouldn’t be commenting on this blog, feeling so strongly about hunting. I simply cannot understand how someone can take a gun and kill a beautiful animal, shooting them to bits, and call that fun or have a nostalgic feeling about it. We don’t have to connect to our past, the past is still here. The supermarkets are full of it, and butchers kill the animals for us. I am just as guilty, I eat meat, buy it in the supermarket, chopped up and packaged so I don’t see the animal anymore. Cowardly, because if I had to kill an animal myself, I’d never eat meat again. So, again, maybe I shouldn’t be commenting on this blog, Where I live, there’s a lot of hunting going on too, the same animals run trough the fields here. I know the people who hunt. And some of them are nice people. And I cannot understand how nice people can be so cruel and heartless. 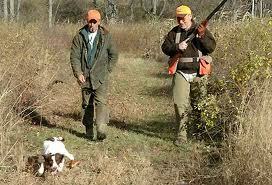 Hunting should be banned. Should be illegal. In my opinion, anyway. And don’t say that some animals have to be shot because there are too many of them, there are too many of them because we take up too much space…. that’s all. Want to connect to the past in a good way? Buy nothing, grow everything yourself. Kill only to eat and stay alive, and never kill for greed (money). In the past we never did see vegetables of animals as “products” or something to hang on your wall…. on October 13, 2011 at 11:15 am | Reply Dianne P.
Not ideal food for diabetics! Give my best to Orea the rabbit version! on October 13, 2011 at 9:41 pm | Reply Dianne P.
Seriously, though, my “Go veggie” comment sounded flip, and I didn’t mean it to– you’ve obviously touched a nerve with people. We all need to be responsible for knowing WHERE our food comes from. If someone is truly interested in protecting their health, the lives of animals, and even the planet, they should look up more on the effects of eating meat. We love our fast-food burgers here in America, but people don’t realize how many COUNTRY-SIZED acres of rain forest are cut down in the world to clear pasture-land for cows just so those burgers can be sold more cheaply!! Similarly, our own Midwestern states and other places are planted with acres of corn & grains to feed cows, which we then eat…Imagine how many people in 3rd world countries could be fed directly from cultivating those acres! If one is going to get truly angry, don’t blame the hunters, who sometimes make death by bullet a lot more preferable than slow starvation by winter’s end–or worse, prey being too weak to outrun the coyotes. Get OUTRAGED over factory farming, hormones designed to unnaturally make animals’ bodies produce more meat, the animals’ horrendous trip to the slaughter house…or crowding, debeaking, skinning while still alive–a virtual nightmare!! At least as you say in France, small farmers know what field their sheep grazed in! The animals saw the sun and were cared for, despite their lives being cut short. If people feel guilty, the least they can do is buy from a reputable farmer & butcher, if you trust them for the humane care of their animals. I like your mantra about “eat to live, just a little, mostly plants.” That’s perfect. And what I like about your Medit. recipes–the veggie ones are very tasty, healthy, & absolutely guilt-free! ‘Nuf said. I hope my post isn’t too late for people to take notice. Cheers & hugs & bunny-winks! “Outraged” is a good word and the right one, to describe some of these practices. I can’t claim the mantra–“Eat food. Not too much. Mainly plants”–as my own! It is Michael Pollen’s–who writes so well about how to eat.